The legendary Blue Note label celebrates its 75th anniversary by reviving the Blue Note All Stars name and releasing this thrilling set from the cream of today’s jazz stars. Blue Note started operating in 1939, releasing hot jazz sides from the likes of boogie woogie pianist Meade Lux Lewis and soprano sax frontman Sidney Bechet. After the second World War the label became closely associated with the hard bop style of the time, producing seminal albums and instantly recognisable sleeve design through 50s and 60s. The label was revitalised by the arrival of Bruce Lundvall as President and CEO in 1984, who brought on a whole new generation of musicians using the maxim “sign originals and give them a long catalogue life”. His success in this endeavour is written all over this collection. 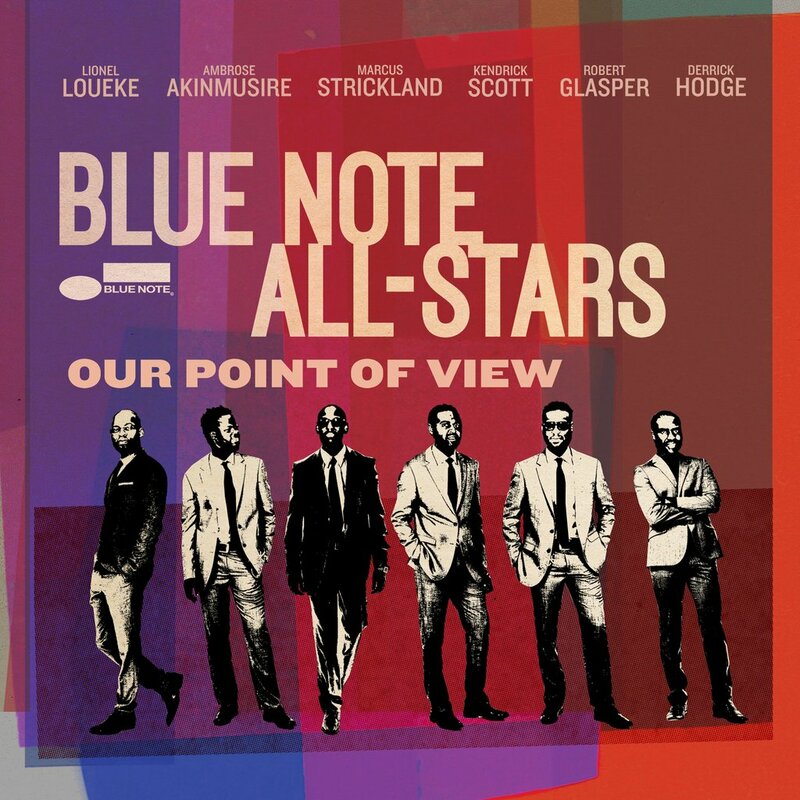 This latest collection of Blue Note All Stars is absolutely worth the stellar moniker. Pianist Robert Glasper is a pivotal figure, producing (with current Blue Note boss Don Was) as well as playing a leading role. Glasper teams up with bass player Derrick Hodge, drummer Kendrick Scott and guitarist Lionel Loueke to form a tight and powerful rhythm section. (Of course, this is 2017 and so these musicians all take a hand in creating the overall sound as well as contributing to all the solos.) 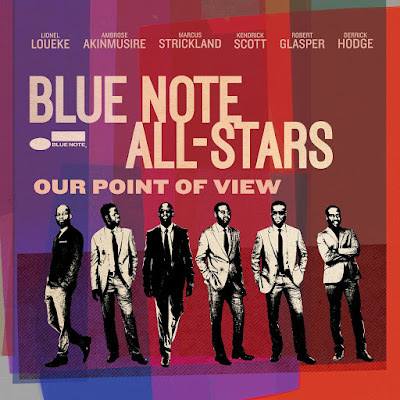 The trumpet of Ambrose Akinmusire and Marcus Strickland on tenor saxophone complete the line-up. What makes this a particularly interesting set is that all the musicians bring along some of their own existing material for the group to work on and interpret, giving a really united band feel. So, Akinmusire’s 2012 tune Henya is brought to life with Derrick Hodge’s acoustic bass accompaniment, while Hodge’s Message of Hope swings along with an almost spiritual feel and a cutting guitar solo from Loueke. Glasper contributes two tunes including Bayyinah (originally recorded on Loueke’s 2012 album Heritage produced by Glasper), where he also gives a sparkling solo introduction - the moment Glasper hits the rhythm of the tune is worth the price of admission on its own. The Blue Note credentials are further enhanced by the inclusion of two Wayne Shorter compositions. Witch Hunt, originally on Shorter’s 1965 Blue Note LP Speak No Evil, is given an extended 18 minute excursion driven up hill and down dale by Scott’s powerful-yet-loose drumming. The flexibility of 21st century drummers – not just Scott but so many others too – lies in their huge flexibility to create rhythms as tight as a drum machine yet at the same time skittering and airy with micro-variations of swing and feel. The historic dimension is taken still further on the other Shorter tune Masquelero, first heard on Miles Davis’ Sorcerer album in 1967 and subsequently performed live by both the Davis band of the time and later by Shorter himself. Not only does Shorter appear through the track on soprano saxophone, duelling effectively with Strickland’s tenor at one point, but Herbie Hancock appears on piano in a similar grapple with Glasper’s synthesiser. The presence of these two legends further illustrates quite how extensive the Blue Note legacy has become. If Blue Note’s original customers fell through a time warp from 1939, this would be a perfect introduction to jazz in the 2010s – exciting, tough, multi-flavoured, yet recognisably in the same tradition as Meade Lux Lewis and Sidney Bechet. A crucial release and another step on the way for Blue Note. Our Point Of View is released today 6 October.